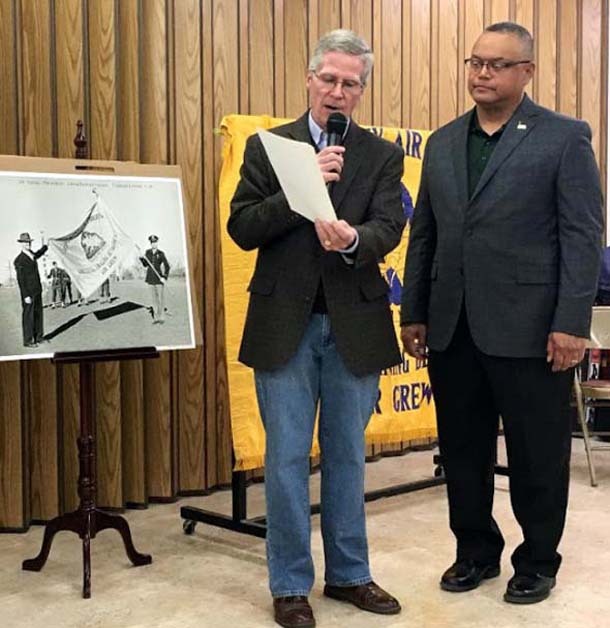 Spearfish Area Historical Society: Society learns about "BHSU During World War II"
Society learns about "BHSU During World War II"
Neil King presents authentic 93rd Army Air Force flag to BHSU President Tom Jackson. It flew over Spearfish in 1943 and was given in honor of Major General Homer "Pete" Lewis. 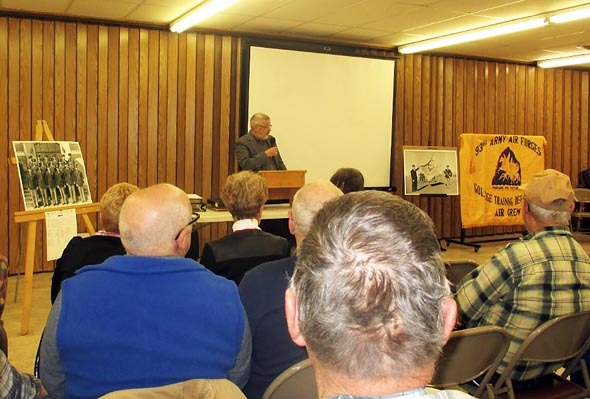 Terry Neil King presented "BHSU During World War II" to approximately 120 people on April 3, 2018 at the Spearfish Senior Citizens Center. King is the son of the 93rd Army Air Force Training Detachment commander Neil King. Co-presenter for the program was Paul Higbee. 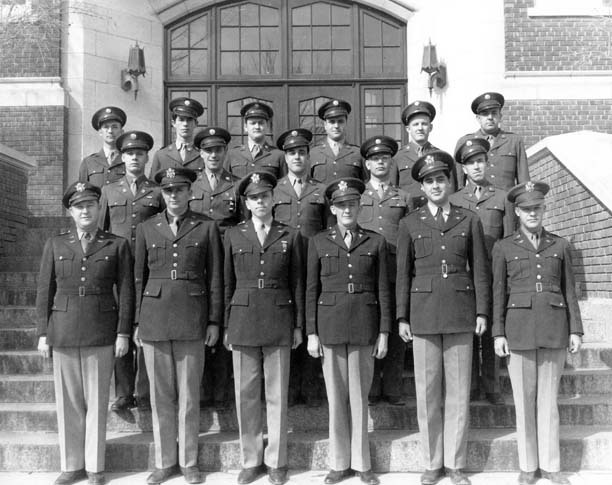 Seventy-five years ago, from March 1943 through May 1944, Black Hills State University, then known as Black Hills Teachers College, was one of 150 colleges and universities across the country (and the only one in South Dakota) that aided in America’s war effort by participating in the U.S. Army Air Force ‘College Training Detachment’ program. first contingent of 200 cadets arrived on March 1, 1943. The cadets would remain for five months, during which time they received academic instruction from members of the BHSU faculty. Instruction consisted of 60 hours in each of the following subjects: Mathematics, English, Modern History and Geography. It also included 24 hours of Civil Air regulations and 180 hours of Physics. All of the aviation cadets had already completed Basic Training and held the rank of Private when assigned to the College Training program. The military phase of their training was conducted by Army Air Force personnel, and consisted of Basic Military Indoctrination, Infantry Drill, Military Etiquette, Customs & Courtesies of the Service, Hygiene & Sanitation and Physical Training. A vital component of the five-month course involved Basic Flight Training that included 10-hours of instruction in single-engine aircraft given by civilian flight instructors at the local airport. 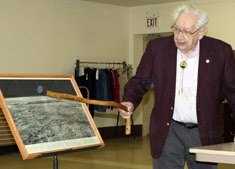 For the 93rd, this activity was performed at Spearfish-Black Hills Airport under the direction of legendary Black Hills aviation pioneer – Clyde Ice. At the same time, other events or activities continued…perhaps with some adjustments due to the times. The ‘Swarm Day’ Homecoming in 1943 was still held, but with music provided by the “Jive Bombers”, the 14-piece dance orchestra of the 93rd. The college newspaper, ‘The Anemone’ was still published and was now joined by the 93rd’s own newspaper ‘Prop Wash’, written by a staff of cadet journalists. Its pages were filled with news from the war fronts and the Home Front, but mainly news about or affecting the 93rd. Intramural sports, especially basketball, volleyball and softball replaced the loss of varsity sports – with team names reflecting the times, like ‘Wings’, ‘Tracers’, ‘Gunners’, ‘B-17s’, ‘Roscoe’s Rockets’, ‘Flying Tigers’, ‘Superchargers’ and my favorite the ‘Magnetos’. In 1943, the 93rd’s softball team won the South Dakota state softball championship, defeating the Rapid City Army Air Base. This program lured one of our largest crowds! 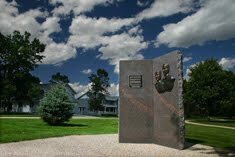 The people of Spearfish not only ‘adapted’ to having the cadets in their community, but in many ways, they ‘adopted’ them as well. 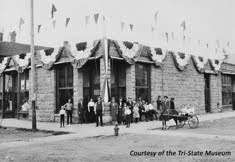 Shortly after the 93rd first arrived in Spearfish, residents realized that there was a need for a recreation center, a place where the cadets could relax during their off-hours. Residents quickly volunteered their time, effort and money to renovate a building in the Matthews block, formerly occupied by the Zink Variety Store, to provide the new recreation center. And, at Christmas 1943, every cadet received a personal invitation to enjoy Christmas dinner in the home of a Spearfish family. Personal ancestry and notes by Terry Neil King—To help understand why and how the subject of today’s program came to be, to set the stage and introduce some of the players, requires a little background information. My late mother was Joan Sunderland. 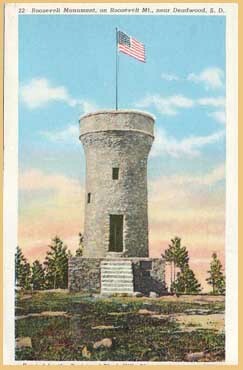 She was born in Spearfish in 1923; she was raised and lived here until 1946. Her parents, John and Edith Sunderland, had emigrated to America in the early years of the 20th century from their small village in Yorkshire, England. 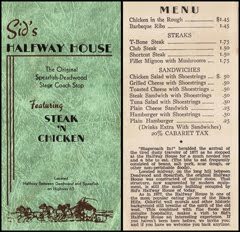 As some of you may know, John Sunderland owned Sunderland Meats on Main Street from the early 1900’s until the late 1950’s. John and Edith lived in, and raised their four daughters and one son in a lovely Victorian white-frame house on Canyon Street. In All Angels Church, on Fifth Street, there is a stained glass window in their memory; in 1944 my parents were married there and six years later it’s where I was baptized. 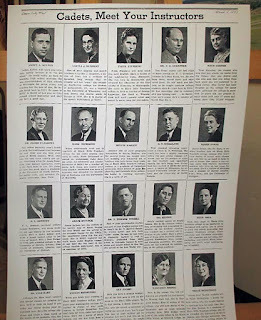 My mother had three older sisters: Kathleen who became an educator in Denver, her first husband was James O’Neill of Spearfish, and she later married Otis Reynolds of Sundance, Wyoming; Cecile who was married to rancher Jesse “Buz” Driskill; and Margaret who was married to O.A. “Bud” Kelley who owned the Kelley Motor Hotel and the Matthews Opera House building. She also had an older brother: Fielden, known as “Skip”, who also worked at Sunderland Meats and eventually ran the business until 1960. In February 1943 a key figure in today’s story came to Spearfish. His name was Neil King, my late father. 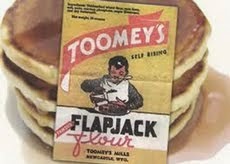 He was a Denver banker by profession who had enlisted in the Army Air Force in February 1942 at Lowry Field in Denver. 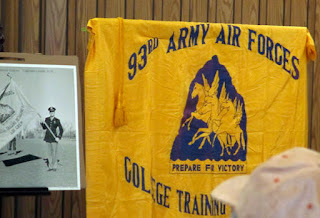 After completing Officers Candidate School in Miami, Florida and a first assignment at Strother Field in Winfield, Kansas, he arrived in Spearfish as a green second lieutenant, along with three other young officers who were all transferred here with orders to form, and then command, what would become the Army Air Force 93rd ‘College Training Detachment (Air Crew)’ stationed at Black Hills Teachers College – now Black Hills State University. 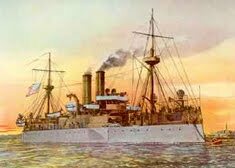 The others were: Captain Homer Lewis, a rancher, from Dallas, Texas - the Commanding Officer; 2nd Lieutenant Charles Gerlach, a cotton farmer, from Livingston, Texas - the Commandant of Cadets; and 2nd Lieutenant Robert Lee, a newspaperman, from Miami, Florida - the Intelligence Officer. My dad, 2nd Lieutenant Neil King was the Adjutant. One month later, 2nd Lieutenant Donald Ballard of Miami, Oklahoma arrived and was the Personnel Officer and Captain William Anderson MD of Dyersburg, Tennessee joined the staff as the Medical Officer. In November, both Lieutenant Gerlach and Lieutenant Ballard were transferred and 1st Lieutenant John Neustadter of Portland, Oregon joined the staff as Commandant of Cadets. 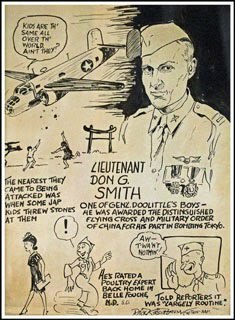 Assisting these officers was a staff of 11 Army Air Force enlisted men who would provide the military training, indoctrination and skills for the aviation cadets who would soon arrive. As a child growing-up, I was fascinated with a large black photo album of my dad’s. 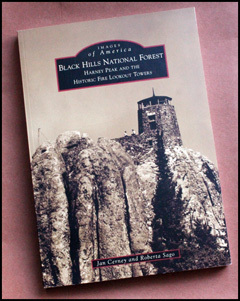 Contained within its pages were dozens of beautiful, large black & white photographs, most taken by Spearfish photographer Josef Fassbender of Black Hills Studio. Those photos captured the images of the personnel, and much of the daily activity, from March 1943 to May 1944 when the 93rd was on the campus at BHTC. 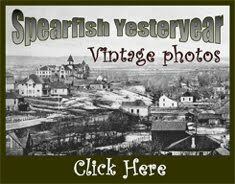 Images taken in and around Spearfish like the Passion Play, Mount Rushmore, Days of ’76 Rodeo and Spearfish Canyon were also included. In addition to the photo album there were two other items that became more and more of an interest to me. The first was a multi-page book/manuscript that outlined in great detail the history of the 93rd from its inception to termination. It had been compiled by my dad in his then-capacity as Commanding Officer. Its pages brimming with specifics about the three phases of training: Academic, Military and Flying. Details of financial data from contract and purchasing budgets and expenses to faculty and staff salaries; comments about the program made by faculty members including familiar names like; Millie Heidepriem, Lavina Humbert, Fred Guenther, Evelyn Hesseltine and Grace Balloch; airport information, runway diagrams, maps and flight patterns with details about the maneuvers and proficiency the cadets were required to execute and demonstrate during their flight training. What made this manuscript so interesting, but also somewhat frustrating, was that it was written in a format similar to, and contained much of the same information, as the online histories of other detachments that I had discovered when trying to locate information about the 93rd. 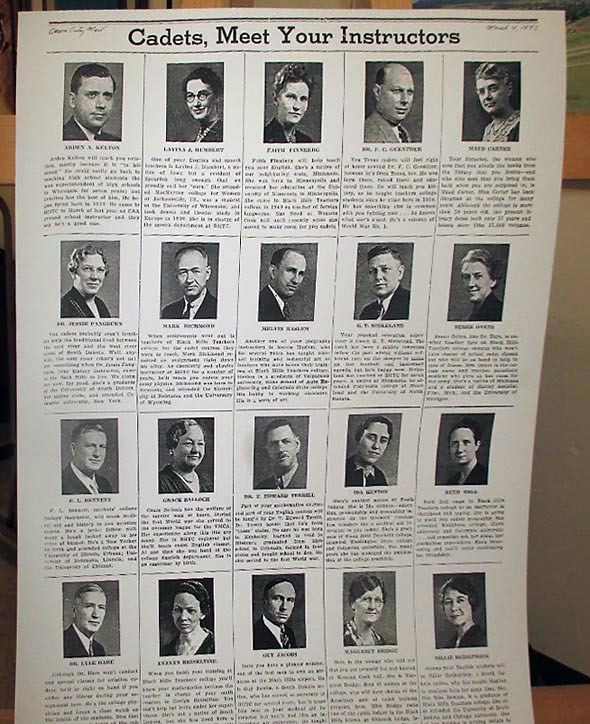 The second item of interest was an ordinary scrapbook, its pages filled with newspaper articles that had been carefully cut and pasted from local newspapers like the ‘Queen City Mail’ and ‘Rapid City Journal’. As I was to discover, the scrapbook had also been created and maintained by my dad during his time in Spearfish. I had seen the scrapbook many times over the years, but had never paid much attention to it. Now, however, as I began to read the articles, in conjunction with the history manuscript, and the always fascinating photo album – it became clear, that contained in those three items was everything that was needed to properly document the story of the 93rd and the role it, the College and Spearfish, all played during the war. 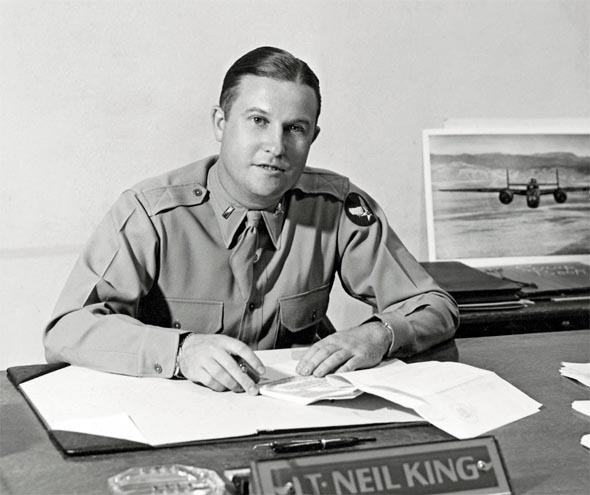 In his journeys investigating the 93rd Army Air Force College Training in Spearfish, King made contact with retired Major General Homer I. 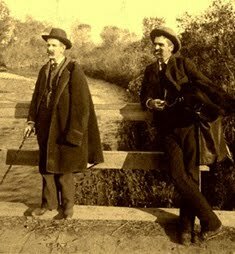 “’Pete” Lewis, who was the commanding officer of the 93rd in Spearfish. Major General Lewis held the original Army Air Force flag flown at BHTC in 1943 and gave the flag to Terry Neil King, who has now donated it to BHSU archives. 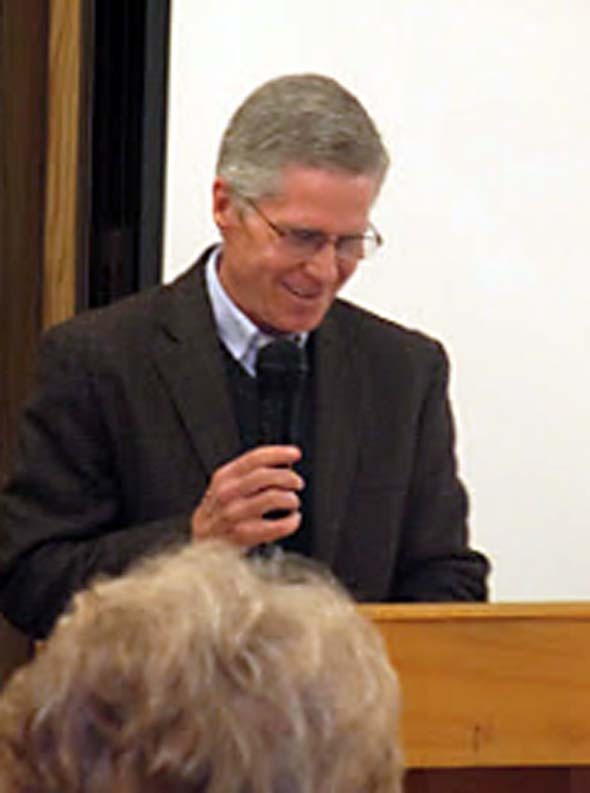 It was presented to BHSU President Tom Jackson at the conclusion of the program.